Basketball Spotlight Class 2016 Alum Tyus Battle traveled to the Coaches vs. Cancer tournament in West Virginia with Gil St. Bernards and received rave reviews for several national media outlets. Battle received “The Stamp” before his 8th Grade year and now is considered one of the best frosh in America. Dave Telep (ESPN): There’s a big difference between scoring and knowing how to score. Freshman wing Tyus Battle (Edison, N.J./Gill St. Bernard’s) is skilled in the discipline of shooting. Rarely do you see a senior, much less a freshman, effortlessly knock down skilled jump shots. I’m talking about one-dribble pull-ups where he uses the glass, deep catch-and-shoots and sly midrange shots. For lack of a more appropriate term, he was beautiful to watch. Battle was the best player and prospect on the floor in a game with a teammate going to Northwestern and a talented DeMatha (Md.) opponent. He finished with a crisp 17 points (7-of-12 FG, 3-of-3 on 3s). SMU and Xavier were here to see him. Good luck, fellas. This guy smells every bit like an elite high-major prospect. Given all the talent in the gym over two days, Battle’s game was the prettiest to watch and laced with more pure perimeter skill than any other player in the gym. And the kid is a freshman! 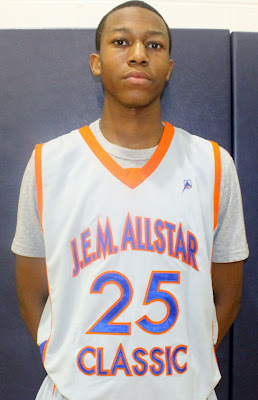 Corey Albertson (Rivals.com): The 2016 guard from southern New Jersey proved that he is one of the most gifted and polished perimeter players in the nation with a breakout performance on Saturday. With Antigua having watched in the stands, look for Battle to be one of the first guys that Kentucky targets when it begins to more heavily recruit the class of 2016. Eric Snow (Scout.com): This is a bad, bad man. He is about 6-foot-5 now and clearly still growing. Battle has an incredible first step, a dynamic floater, and a nice looking stroke on the perimeter jumper. Add in that he can handle the ball well and he has an excellent feel, and it is easy to see why people were so impressed. Battle finished with 17 points and was just unstoppable when he got the ball. As time goes on he will be one of the incredibly elite players in this class.